Welcome to Rocket Embroidery & Printing Ltd. We are based at the heart of St Helens, Merseyside and provide a wide range of clothing available for personalisation. Our services are provided to customers nearby in Liverpool, Warrington, Wigan, Manchester & the rest of the UK. Whatever type of business you run, Rocket Embroidery have the tools to provide your company with the best Workwear & Staff Uniforms. We stock 1000’s of products that are suitable for many types of work environments. We stock a wide range of clothing for all industries including Hair & Beauty Clothing. Hospitality & Chefswear, Safetywear, Corporate Clothing and much more. Company logos or Text can be printed or embroidered onto all of our workwear products. Many trusted brands are available to be purchased plain or customised. We stock a wide range of clothing from major brands including Nike, Adidas & American Apparel. Choose from our online shop now, many clothing products are available to purchase. 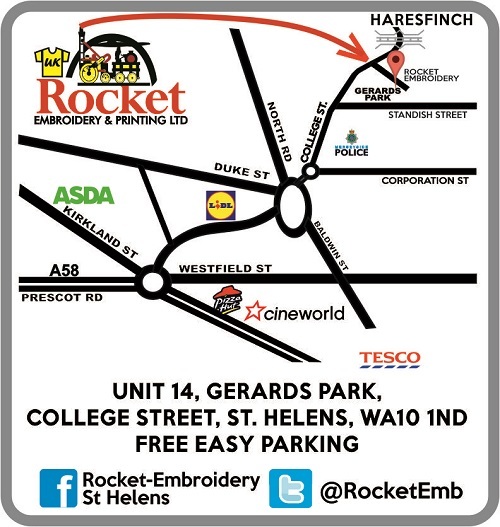 Rocket Embroidery is situated at the heart of St. Helens, Merseyside. We provide a first class finest quality embroidery and printing services to customers across the North West of England and the rest of the UK. Order your personalised clothing with us, we promise to provide the highest quality products at the fastest turnaround times.